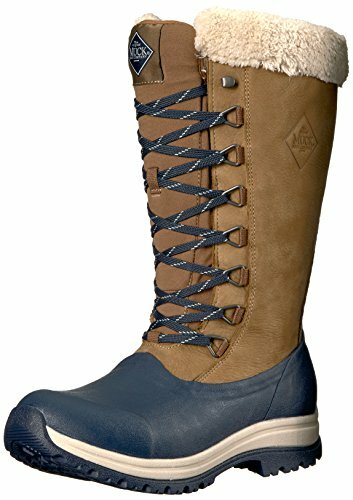 Muck Arctic Après Series Tall Rubber Lace-Up Women's Winter Boots combine style and protection to keep you looking great while staying warm throughout the day. Comfort rated from -20 °F to 50 °F (-30 °C to 10 °C), these women's winter boots feature a premium waterproof leather upper and elegant lace-up front. For a cozy feel and added warmth, the boot is lined with fleece and topped with faux fur that fits snugly around the upper leg. An EVA insole provides lightweight cushioning, and the women's-specific fit ensures longwearing comfort. A slip-on gusset design makes for easy on/off, and the metal eyelets are durable and quick to lace. For added safety, these waterproof winter boots feature rugged outsoles that provide improved traction on slippery and uneven surfaces.